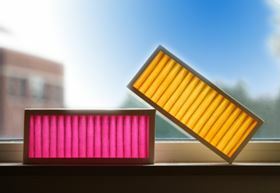 Serionix's Colorfil smart filters let you know when they are working (pink) and when they're spent (yellow) with an intuitive, unambiguous colour change. Serionix creates high-performance filters based on a proprietary adsorptive coating technology called Colorfil™, which changes colour as it removes toxic chemicals and odours from air, while killing viruses, bacteria and mold. Through an intuitive, vibrant colour change, Colorfil lets users know when the filters are working (pink) and when they aren’t (yellow). NASA has awarded funding to evaluate Colorfil technology for incorporation into the next generation of spacesuit and Personal Life Support System (PLSS), which is used during spacewalks to keep astronauts safe, healthy and comfortable. The PLSS requires ultra-high performance air filtration to eliminate toxic chemicals such as ammonia and formaldehyde. “We are excited for the opportunity to work with NASA to send our Colorfil technology into space!” said Serionix president James Langer. The first phase of Serionix’s project with the NASA SBIR (Small Business Innovation Research) program began in June 2016, and overlapped with the successful beta launch of the Colorfil air purifier and HVAC filters. In this second phase, Serionix will develop a demonstration unit suitable for incorporation into NASA’s spacesuit life support system. Founded in 2011, Serionix is based in the University of Illinois Research Park in Champaign, Illinois. Raleigh, North Carolina-based FilterEasy provides a subscription HVAC air filter fulfillment service using a web-based platform. Mott Corp has officially opened a new Rapid Prototype Manufacturing Cell in Farmington, Connecticut, USA.